Malibu Boats, the Loudon, Tenn.-based maker of watersports towboats, is the latest area company to go public. The boat maker has set its IPO price at $14 per share and is scheduled to start trading today on the Nasdaq market under the symbol MBUU. The company is looking to raise more than $100 million. With the economy gaining strength and consumer confidence improving, Malibu’s timing looks good. After toughing out the Great Recession, Malibu has seen its earnings rise in recent years as it has rolled out a number of new products. Malibu’s wakeboarding Surf Gate technology received its second patent last September. Raymond James and Wells Fargo Securities are acting as joint book-running managers for the offering. SunTrust Robinson Humphrey and BMO Capital Markets are acting as co-managers. Click here for more on Malibu from Seeking Alpha. Click here for a Wall Street Journal Marketwatch report on Malibu. This entry was posted in Uncategorized and tagged earnings, IPO, Malibu Boats, MBUU, Nasdaq, public offering, Recession, Surf Gate, wakeboarding on January 31, 2014 by Roger Harris. 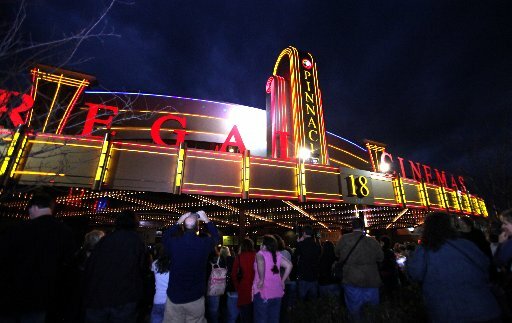 For the second time in three years, Regal Entertainment Group, the largest movie theater operator in the country, has frozen the salaries of its top executives. But don’t feel too sorry for the Knoxville-based company’s execs. Regal’s board last week approved healthy six-figure bonuses for the top five officers, according to a Securities and Exchange Commission report filed Wednesday. This entry was posted in Regal Entertainment Group and tagged Bonuses, executive, frozen, Recession, Regal Entertainment Group, salaries on January 20, 2011 by Roger Harris. With the Christmas shopping season entering the stretch run, Consumer Repor ts’ latest survey offers an interesting look at consumer attitudes. Half of us are “enthusiastic” about the holiday shopping season, but almost one-third of Americans say they are worse off financially than they were last year, according to the Consumer Reports Holiday Shopping Poll. This entry was posted in Holiday shopping and tagged Consumer Reports, Consumer Reports Holiday Shopping Poll, holiday, Recession, shopping, spending, survey on December 17, 2010 by Roger Harris. Congress should vote immediately to extend all of the Bush tax cuts. It’s only fitting. The Bush recession and the Bush deficit were extended, so we should extend the tax cuts, too. Even for those households earning more than $250,000. This entry was posted in Taxes and tagged Bush tax cuts, deficit, House, President Bush, President Obama, Recession, Senate, tax cuts, taxes on September 21, 2010 by Roger Harris. In case you missed it, the Oracle of Omaha says the economy is headed in the right direction. Not everyone considers what Buffett says as gospel, but there’s a reason he is one of the world’s richest investors. Actually, there are a bunch of reasons. Here’s what some others think about Buffett’s comments. This entry was posted in Economy and tagged Berkshire Hathaway, Economy, investors, Recession, Warren Buffett on September 14, 2010 by Roger Harris. Government number crunchers always provide fascinating reading. Today, for example, the Commerce Department said the GDP from 1998-2007 was on average actually 2.7 percent, or $301.5 billion, higher that we thought. Higher, that is, “if research and development (R&D) spending was treated as investment in the U.S. national income and product accounts,” according to the the Bureau of Economic Analysis. So, does that mean if we count R&D spending the recession really wasn’t all that bad? This entry was posted in Economic Analysis and tagged Bureau of Economic Analysis, Commerce Department, GDP, Recession, research and development on June 30, 2010 by Roger Harris. Companies are still cutting jobs – as evidenced by Hewlett Packard’s announcement Tuesday that it would slash it’s global payroll by 9,000 workers over the next three years — but the pace of layoffs is slowing. That’s what passes for good news these days, but at least the economy continues to recover. In May, U.S. employers said they planned to cut 38,810 jobs, the12th straight month when job cuts were lower than the same month in the previous year, according to the Challenger, Gray report. This entry was posted in Job Cuts and tagged Challenger, Gray, Jobs, layoffs, Manpower, Recession, recovery on June 2, 2010 by Roger Harris. Are we still in recession? I thought the recession was over. Not so, according to this New York Times report. Apparently, a committee of the National Bureau of Economic Research says the data isn’t clear cut. This entry was posted in Recession and tagged Natinal Bureau of Economic Research, Recession on April 12, 2010 by Roger Harris. Here’s another reason job creation has been slow — some of Corporate America’s big dogs are sitting on piles of cash waiting to make their move. Check out this story in the Los Angeles Times that talks about how some of America’s largest corporations — including Memphis-based FedEx — have come out of the recession with plenty of money in the bank. The question is when will they start to spend? When they do, we should start seeing improvement in the jobless numbers. This entry was posted in Economy and tagged cash, FedEx, Job, money, Recession on March 26, 2010 by Roger Harris.